These beautiful handmade trinket dishes are a unique and meaningful gift for any female professional, especially those women in your office who are recently engaged or married! Each dish is hand-pressed with lace to create intricate and unique patterns. Click here to be notified by email when Handmade Trinket Dish becomes available. King's Home provides safe housing and a therapeutic work environment for women and children fleeing domestic abuse, homelessness, and other difficult circumstances in Alabama. For over 40 years, King's Home has served over 400 at-risk women a year, providing them with meaningful employment while equipping them with the entrepreneurial skills needed to succeed. Since starting Prodigal Pottery in 2014, over 30 women have been employed and many are working on their GED's and growing their basic job skills. 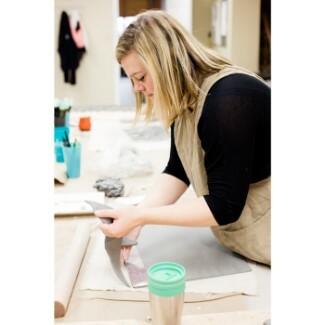 Your purchase of Prodigal Pottery today creates one hour of employment for women at-risk in Alabama.